It truly is a great time to be a guitar player. We have finally arrived at a time and place where it’s harder to find a bad-sounding amp than a good-sounding one. With so many choices of amplification for guitar including mass produced, low-cost tube amps; mega-bucks, hand-wired tube amps; computer- and tablet-based, amp modeling plug-ins; hardware profilers; and stand-alone amp and effects modelers, it’s hard to choose just what to use. 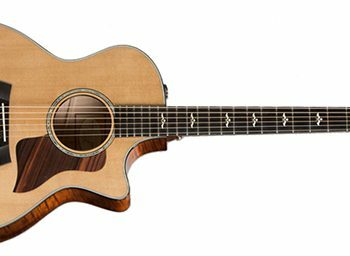 Of course, if you’re like the gear geeks here at MusicPlayers.com, you probably invest tons of money in multiple options from every category. But if you’re on a more conservative fiscal diet, like, um… normal people, picking the right solution is a tougher call specific to your performance and/or recording needs. Digital amp modeling has its roots back to the 1990s and the legendary, kidney bean shaped, Line 6 POD. This was among the first successful compact digital amp modelers that promised all of our highly loved and lusted after tube amp tones in a single desktop device, all for the low price of a few hundred dollars. Although amp modeling was a great idea and off to a good start, the technology was in its infancy. Not all models sounded accurate, and the response/feel of the products was a bit sterile. Useful in the studio, but nobody was giving up their real tube amps just yet. Computer innovation being what it is, fast forward twenty years and we see tremendous strides in amp modeling technology. Today’s modelers have super-fast processors, slick and simple-to-use software editors, common sense and well laid out hardware, and for the most part, they sound great! You can now choose among multiple amp modeling products that sound and respond well enough to ditch the tube amp if you’d really like to go with a compact solution. We do admit, this review was approached with a healthy dose of skepticism. Let us be clear: we love our tube amps and there will be no massive eBay or Reverb.com liquidation of our amps! However, with more and more of our idols touring the world with little more than amp modelers in tow—and countless more players relying on them in the recording studio, we were curious to experience for ourselves just what todays modelers sound like, and to experience how they hold up compared to the real deal both in terms of response as well as operationally. We received three cutting-edge, floor-based, amp modelers for this review: the Fractal AX8, Line 6 Helix Floor, and HeadRush Pedalboard. We’d like to say up front that these modelers made real believers out of us. They were a lot of fun to review, and we even ended up purchasing one of them in the end. Gear this fun and useful is hard to let go of. We spent a good amount of time with these three modelers, learning the ins and outs of them and getting sound opinions in different situations Is there a clear-cut winner and loser among these? Not at all! You can get real amp tone from each product that will fool any listener, though each modeler has different capabilities that will endear them to one player or the next. These are not a one-size-fits-all kind of product, and just because people rave about any one of these products doesn’t mean it will be the right one for you. All three of these modeling pedalboards have numerous big-name musicians using them successfully on tour and in the studio, which is further proof that these are good enough to stake your livelihood on. The day has finally come where guitarists from the working professional to the weekend warrior to the session guy can all make meaningful music without their beloved tube amps. Whether or not these products make sense for you is a question we can’t answer. But at least we can say that with any of one of these great modeling products, you won’t have to make any excuses for leaving the big rig at home. Dimensions 10.3" x 16.1" x 4.0" 22.05” x 11.85” x 3.58” 23.6" x 11.2" x 2.9"
The Fractal Audio AX8 pedalboard is housed in a rugged, steel enclosure, and it features a seemingly staggering 222 amplifier models (all of the models from the Axe-Fx II), including some rare and unique amps, and over 130 cabinet models. Don’t be misled by the number. Technically, there are only 119 different amplifiers, but in order to utilize one consistent interface across all amplifiers, Fractal Audio creates and saves separate models for each channel or mode of the amp they are modeling. Thus, a typical three-channel amp like the Peavey 5150 would count as having at least three models in the AX8. 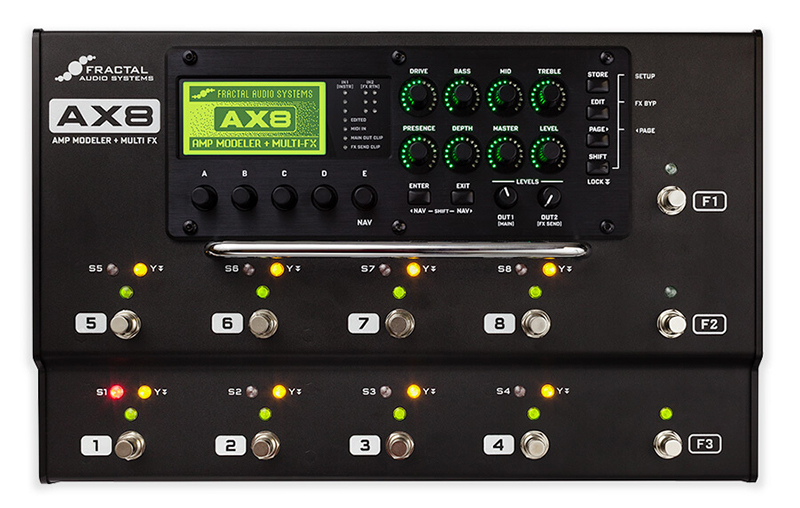 The AX8 has over 130 different effects arranged into 23 general effects categories. You would be hard pressed to not find numerous effects options for the sound you’re after in this box. Although you don’t see microphone models listed as options, Fractal Audio’s Ultra-Res speaker simulations are based on captured impulse responses, that contain the characteristics of specific microphones used in the models. So you are getting speaker models with popular microphone choices, just with fewer editable options. And, you can use two IRs at the same time in order to create a multi-miked blend. Physical connectivity is mostly well thought out on the AX8. All of the ins and outs are arranged on the back panel, starting with ¼” instrument in, followed by our ¼” balanced and mic line out section. There are stereo ins and outs for the effects loop to accommodate any mono or stereo pedals (or chain of pedals) you want to include in our signal chain. 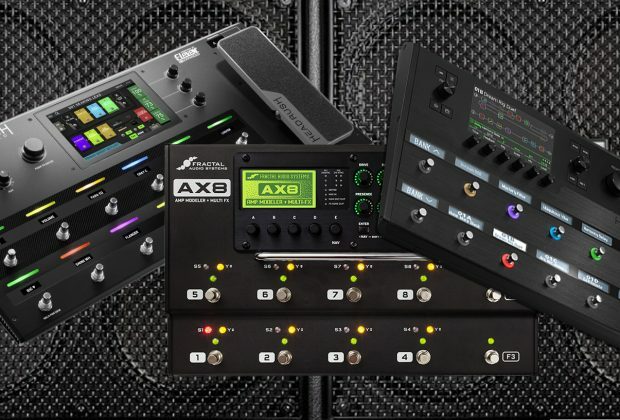 This is the only modeling pedalboard in the roundup lacking a built-in expression pedal, but the AX8 makes up for that with four expression pedal inputs… and some players will prefer the smaller footprint that this design consideration allows for. Besides analog output, there is a digital S/PDIF output as well, but surprisingly, while an included USB port provides essential computer connectivity for sound editing, updates, etc., it does not pass digital audio to the computer. There are MIDI In and Thru jacks, and an internal power supply rated from 100-240 VAC, assuring you can play any venue on Earth uninterrupted, provided you have that country’s necessary power cable (a standard IEC power cable is included). The AX8 is the lightest and smallest pedalboard of this bunch, partially due to not including a pedal. Not every guitar player needs or wants one, so for gigs where you can ditch the pedal, the AX8 is the easiest to carry, easily fitting inside a laptop computer case. The Fractal Audio AX8 has a monochrome LCD display that displays various settings related to your amp models and effects. Five knobs beneath the display correspond to virtual controls on the display for making adjustments. To the right of the display is where you’ll find included eight knobs that mimic common guitar amp controls including Drive, Bass, Mid, Treble, Presence, Depth, Master and Level. You can adjust all of these controls in real-time just as if you were working with a physical amplifier. They are rotary encoders with colored LED indicators, so they always show the current settings for whichever amp model you’re playing. For more advanced sound design and effects/rig editing, Fractal Audio provides the AX8-Edit software editor for the computer. This provides a robust user interface for managing all aspects of your AX8 from sound design to managing your library of sound patches. The onboard memory contains room for saving up to 512 presets, but each preset can contain up to eight scenes. Scenes are useful for switching different states of various components within a preset. It can be virtually anything. Want more mix on a delay? The amps gain a little higher? You can assign these types of changes, as well as effects On/Off state, within different preset scenes. This makes patch management more manageable, especially for a gigging musician, as you can create one preset for each song you play, and within each song, different scenes cover your sound and effect changes for the various parts of the song such as intro, verse, chorus, lead/solo, etc. Our biggest gripe: This is the only floor-based modeler in the group that lacks a headphone jack for silent practice, which may be a deal breaker for some players looking for a solution that also works in the living room while the kids are asleep. AX8 Tip: If you would like to practice/rehearse silently with the AX8, you can add a personal monitor amp like the Rolls PM50S or a Behringer MA400 headphone amp. These inexpensive accessories connect to the main outputs, give you a pair of headphone jacks with level control and more. Line 6 has the longest history of anyone in this product category, having built their business on amp and effects modeling. Their new flagship, floor-based unit has been completely developed from scratch, based on an accumulation of decades worth of experience. This is not your father’s kidney bean POD in a rectangular package. A dual DSP-powered modeling engine powers the Helix Floor with a collection of 62 amp models and a mind blowing 107 effects. The Helix Floor has a full-color, 6.2” LCD display, as well as LCD scribble strips above its 12 stomp buttons so that you always know at a glance what each footswitch is controlling/selecting. 13 cabinet models and 16 mic models provide a healthy number of options to pair with the amp models. There are 37 speaker cabinet models to choose from, and many have been created from impulse responses similar to Fractal Audio’s approach. 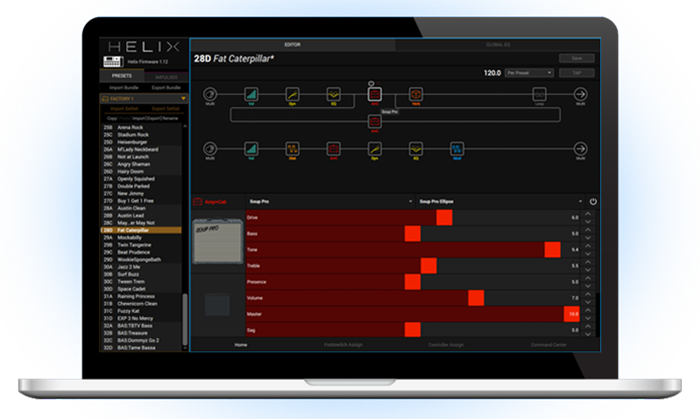 You can also load your own (or third party) IRs into the Helix should you desire. Physical connectivity with the Helix Floor leaves nothing to the imagination. From the left of the rear of the unit, we have a quad of quarter-inch inputs offering two additional expression pedals (there’s one built in), as well as a TRS output for your amp’s channel switching foot controller and a CV out as well. There is a guitar input and another quarter-inch aux input. The Helix Floor also serves as a digital audio interface for your home studio, and it even includes an XLR microphone input. There are two stereo effects loops that can be placed anywhere in the signal chain. Rounding out the connectivity, you get stereo XLR outs, Line outs, a headphone jack, S/PDIF and AES/EBU digital inputs and outputs, MIDI In and Thru, and a USB port. A headphone jack with independent volume control is provided for silent practice. 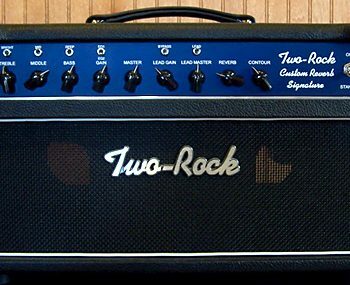 Clearly, this is meant to be the centerpiece of the guitarist’s universe, with more versatility than “just” serving as an amp/effects modeler. 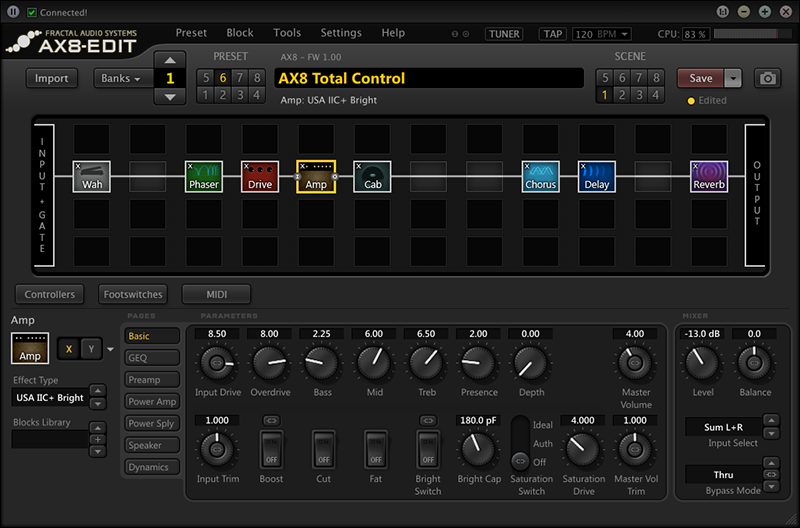 Just as with the AX8, the Line 6 Helix Floor has presets and snapshots. The Helix Floor can store 1,024 presets, each with up to eight snapshots, along with eight set lists that keep patches arranged in just the right sequence for easy gig access. The Helix Floor also includes the Helix Editor, which is a computer-based software editor and patch librarian that facilitates easy editing of your Helix sounds. 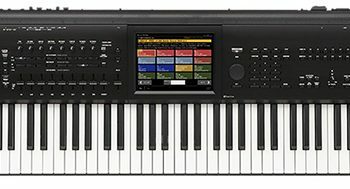 This is handy, however the Helix Floor’s multi-color display is significantly improved over previous generation Line 6 products and is designed for easy rig editing without the computer. The high-definition graphics are superior to anything you ever saw on preview POD-related products. 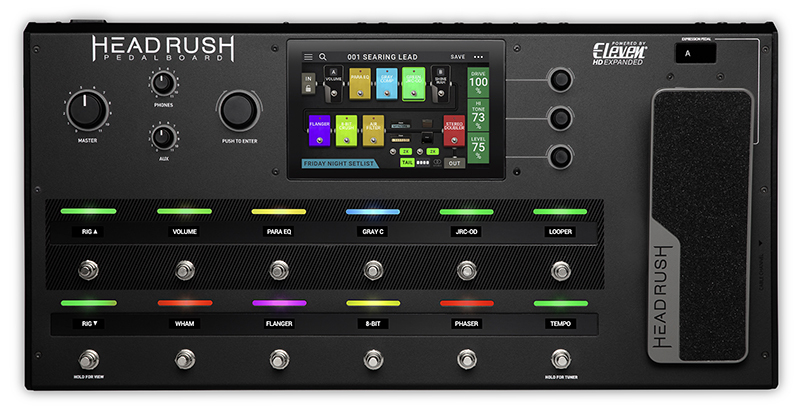 The HeadRush Pedalboard traces its roots back to Avid’s popular Eleven amp modeling plug-in, which was/is available exclusively to Pro Tools users. Countless artists made records with it, so it was only a matter of time before someone posited the question, “Hey, what if we took this software and made it into a hardware product?” But they didn’t just port the computer software over. The new Eleven HD modeling technology is significantly improved over the computer-based product, as the dedicated DSP chips in the hardware allow for more sophisticated digital signal processing. 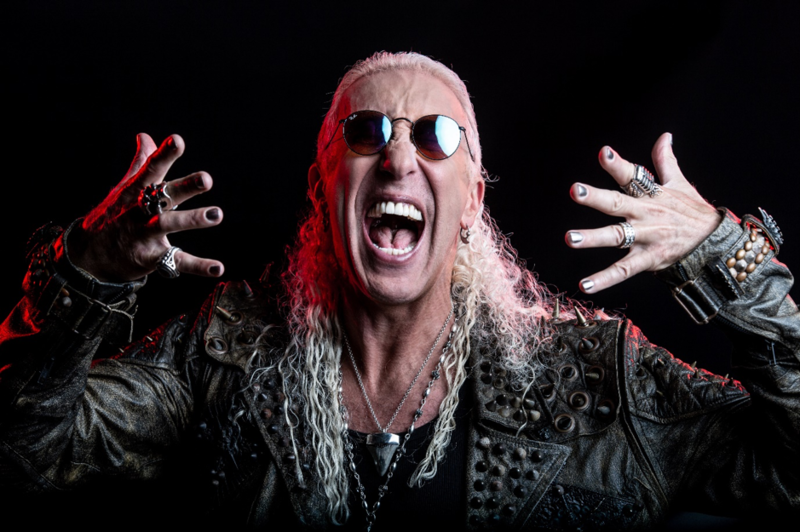 The HeadRush includes a trim selection of just 34 amp models, 15 cabinets, and 40 effects. More than adequate to get the job done, but we would have liked to see a few more options across the board (pun intended). You can expand the speaker cabinet options by loading your own (or third party) impulse responses, and HeadRush even provides a free download of IRs custom-designed for them by Celestion. The HeadRush’s nicest feature is easily the beautiful, seven-inch touchscreen display, which easily makes it the sleekest looking package out of these three modelers. There is an included expression pedal that can control up to two assignable parameters, as well as 12 footswitches to select rigs, models, user defined setlists, or effects. Large, color-coded LEDs and digital scribble strips on each footswitch provide an unprecedented level of clarity as to what the product is doing. Master volume independent from a dedicated headphone level was a nice detail. On the rear of the HeadRush, you’ll find guitar and aux inputs. Quarter-inch and XLR outputs are provided, as well as one stereo effects loop plus MIDI In and Thru. There is also a headphone jack with dedicated volume control for silent practice. The HeadRush has 270 presets and also provides the ability to save scenes for each rig so that you can instantly change various pedal on/off states within a rig from a single footswitch. It also enables you to arrange your presets into Set Lists for easy gig organization. Much like the Helix Floor, the HeadRush is designed to be completely editable with your feet. Holding any stomp footswitch for a second or longer enters hands-free mode, and allows for deep editing of that particular model or effect using the expression pedal to set parameters. If you do want to get your hands involved, setting up your rigs and signal chain is literally as easy as dragging an effect block from one space on the display to the next. And as with the other products, you can insert your external pedals (connected to the effects loop) anywhere in the signal chain. The HeadRush can also serve as a USB audio interface for your virtual guitar rig, though it lacks a microphone input. There is no software editor available, but as you’ll read shortly, with HeadRush you won’t need it. Going from physical amps to modelers or profilers can be challenging depending on user application. For the live gigging guitarist (Aren’t they all “live?” No dead guitarists were questioned for this review) accustomed to playing through a combo amp or 4x12 cabinet, there is a certain amount of monitoring coming off the physical speakers we become accustomed to. That, of course, no longer exists in a modeler situation, unless you add a full range, powered speaker or a power amp and traditional speaker cabinet to your backline. Each approach has various pros and cons worthy of another article. Some guitarists have no problem with the typical monitor wedge mix of their miked guitar amp signal coming straight up at them while playing and prefer whisper quiet from their backline. Other players are now accustomed to performing with in-ear monitors, eliminated nearly all stage volume. With these solutions, this is exactly what you will hear: the sound of a miked cabinet in whichever monitoring method you rely on, although these products also enable you to bypass their speaker modeling if desired based on your overall rig preference. 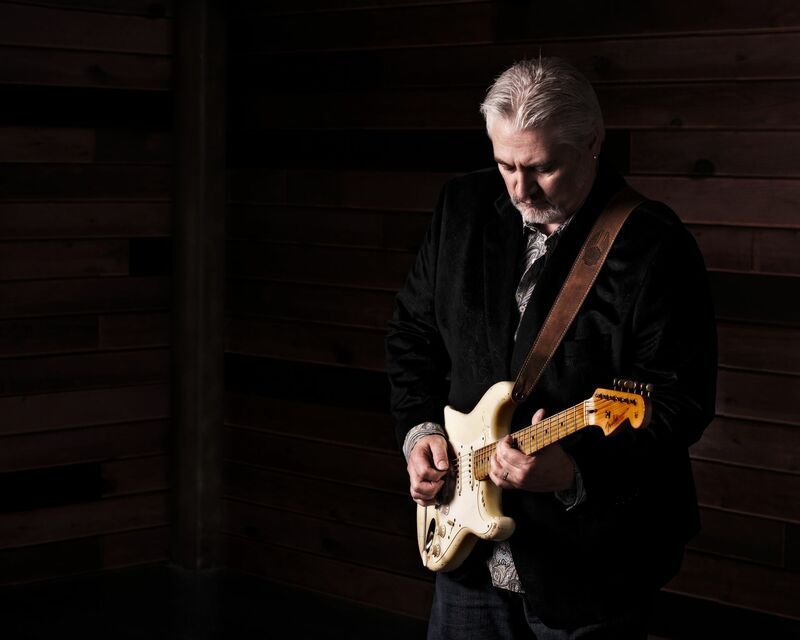 Every situation is different, and every guitarist’s needs and preferences are different. We are confident taking this into consideration, virtually every guitarist can make a modeler work just fine in the live setting, but they must evaluate their current guitar rig, honestly assess what they like and/or require from stage monitoring, and replicate their preference as close as possible. Of course, some players just want the flexibility of having tons of amps and effects at their disposal for recording, and each of these products will provide a seemingly limitless number of options for amps, effects, and experimentation. One area where we experienced a real difference between each of these modelers is in the response: how the amp models felt when we played them. At one end of the spectrum, playing the Fractal Audio AX8 felt like playing a real amp in the studio, while playing the HeadRush pedalboard felt more like playing an amp modeling plug-in in the studio. It has tremendously useful sounds, but all of the amp models tended to feel and respond in a uniform and somewhat sterile manner. Somewhere in the middle, but leaning slightly closer to the AX8 in feel, was the Helix. It felt better than using amp simulators on a computer in the studio, but didn’t quite rival the feel of the AX8. The Fractal Audio AX8was as plug-and-play as you want it to be. After unboxing, we connected our guitar to the guitar input on the rear of the unit and connected the AX8’s two main outputs to our PreSonus Studio 192 interface in the studio. Monitoring through our Adam A7 monitors, we instantly recalled preset sounds easily and found quite robust, well thought out, and gig ready, presets. We could easily adjust basic amp settings to taste as well. So in this sense, we can stop right here. Perfectly plug-and-play, and as well thought out as it was, we could grab and go right out of the box after demoing just a few presets, and in fact, we did this, taking the AX8 to a gig within hours of first exploring it! Of course, with a piece of gear this powerful, we couldn’t stop there. Connecting the AX8 to our studio Macintosh via USB, the beautifully designed AX8-Edit software provided far deeper editing than was apparent from the face of the unit. Tube types, even transistor types and amp biasing, can be controlled and tweaked to taste on a per preset basis! The AX8 offers a tone tweaker’s paradise. If swapping out tube types and amp or pedal components is what you like to do, the AX8 will take the guesswork out of the equation and allow for minute changes in the signal path, without blowing anything up. Creating patches in AX8-Edit is laid out intelligently in a four by twelve block grid, input to output from left to right. This is where components are arranged naturally, like we would with a physical rig. If you don’t “connect” your Marshall Plexi to a speaker cab, that’s exactly what you’ll hear: an amplifier head plugged straight into your board. Awful! The four by twelve grid also allowed for series and parallel effects routing, as well as placing effects after the cabinet if we so choose to, just like a classic studio setup. Importing presets from other users was a breeze, with the procedure just taking a couple of mouse clicks. We actually appreciated that we had no control over microphones or their placement, instead relying upon the models and their IRs to provide the right speaker sound. After all, while accomplished guitarists can dial in great guitar tones, most players are not experienced audio engineers with expert knowledge regarding how to mic a speaker cabinet. With an unprecedented level of granular detail editing the sound of the amps and effects, it was nice not having to worry about messing up details in the final, potentially trickiest part of the signal chain. It was easy enough to edit basic settings on our presets directly from the AX8, but really dialing in our own sounds called for using the editor software. Consider it an essential piece of the AX8 equation, because it really transforms the sound design experience (amp/rig building). We were able to fly through creating and arranging our patches and scenes, then just take the AX-8 to the gig, and tweak things on the fly as needed from the physical controls on the unit. It was equally easy getting the Helix up and running and playing through presets, and the USB out from the Helix synced up quickly with the HX-Edit software. However, navigating even basic functions related to understanding the selected guitar rig required consulting the Quick Start section of the manual if we wanted to control the Helix via the unit itself and not the software. There is a significant learning curve, but once you learn your way around the functions, recalling patches and editing sounds become second nature. We admit to relying on the GUI to do much of our recalling and editing. The display is a marked improvement over the Line 6 products of yesterday, though nothing beats full-screen editors on your computer (and Line 6 provides that, too). Line 6 provides matching cabinets to their amp models, and they’re recallable in single Amp+Cab blocks. This was particularly useful in getting up and running quickly when writing a preset, as well as first exploringthe models in their intended use. Of course, if we wanted to run our Mesa Rectifier model out of a single 1x8” speaker model insead of a Mesa 4x12 cabinet, we could opt to do that. Note, we don’t actually recommend that particular combination. Entering Pedal Edit mode was where we really saw how well thought out and user friendly the Helix was. When entering Edit mode, the scribble strips change to components of the selected preset to edit. When selecting one of those footswitches, the scribble strips then changed to display parameters for that particular component. For instance, if we selected Edit mode, then selected the amp we were using, the scribble strips changed to the amp controls like Gain, Bass, Treble, etc. Then we could select one of those values and use the foot controller or two footswitches to toggle up and down in order to adjust the value. We could then save the preset and move on, all while working hands-free. There were no surprises connecting the HeadRush. Power supply, guitar inputs and TRS/XLR outs were self-explanatory and logically placed. The HeadRush’s simplicity of design cannot be understated, and really, none of the other products reviewed here come close to the ease-of-use that you’ll find. Given the big and beautiful touchscreen, understanding how to operate a smartphone or an iPad was basically all the knowledge we needed to not only select rigs, but for editing as well. No software editor exists, but given the massive touchscreen and superior, well-thought out interface, none is needed, either. With even a casual knowledge of navigating and programming guitar equipment, even the documentation was mostly unnecessary, unless a specific technical aspect of rig needed to be adjusted. Even for that, it was just time saving to consult the manual, but still probably wasn’t needed. Navigating through the presets was simple enough to do, with a curtain-like, drop-down list that you literally drag down from the top of the display, and the presets are grouped as preset types, as opposed to a random, numerical value. For instance, all of our lead presets were grouped together. This is a slick feature, given they consider the starting point of what a guitarist might be looking for in a preset. We really liked the three knobs to the right of the display. We could assign any three parameters from a preset to these for instant adjustment, and their large presence on the display made them easy to see when we needed to make a quick adjustment. No menu diving or squinting at smaller options on a display were needed. Hands-free editing is similar to the Helix, in that once we entered Edit mode via the long hold of a footswitch, each of the scribble strip displays changed to that particular component’s values. Every parameter was available via our feet, and if the generous display and scribble strips weren’t enough to display them all, two controls are assigned to toggle access to the remaining parameters. Anyone tired of struggling with small type on compact displays will immediately see the benefit of the HeadRush’s generous display, as options are easier to read here than on any of the other products. We really wanted to see a little more adjustability of the amp models, though. Yes, basic functions existed, and we appreciated being able to handle virtual representations of all the knobs of the physical amp in our virtual model, but deep editing of components and tube types were not available. If you really want to dig in and tweak crazy details in your rig, look to the other products here. But for the less techie guitar player—who wants bread and butter without having to learn to use something more than a butter knife, the HeadRush’s lack of complexity and supremely easy-to-use touchscreen interface make it an easy favorite. All three of these products sound very good or better, and when dialing them in with the right settings and sound reinforcement considerations, each of them will enable you to leave the big rig at home. The AX8, Helix Floor, and HeadRush offer numerous amp models, numerous effects, and impulse responses in their speaker cabinets for greater authenticity of sound. These are not the modelers of yesterday, but products in a maturing market that is ready to be taken seriously by serious guitar players. We tested each of the products through Adam and KRK studio monitors as well as through a full-range PA system with subwoofer. All were tested stand-alone, though you can optionally use any of these as a multi-effects processor for your “real” amp, bypassing amp modeling and cabinet simulation. Or, you can use these to expand the tonal options available within your real amp. You can also take favorite pedals of yours and run them in these pedalboards’ effects loops. However, this review is focused on using each product as a standalone, full rig replacement. The Fractal Audio AX8 is so realistic sounding and amp-like in response that it’s scary. Overall, after plugging in our Gibson Les Paul Slash VOS and demoing the presets, we focused on a few classic amps. The Marshall Plexi, Mesa/Boogie Dual Rectifier, and Fender Twin models were as if the amp was miked in another room. We found these amp models to be shockingly lifelike, both in sound and feel. The sound was virtually indistinguishable from having miked amps somewhere else in the studio. There are plenty of boutique amp models to choose from, and given that we also own a Friedman Brown Eye, we had to give this model a workout. Wow! Once again, Fractal Audio really nailed the tone of this coveted, boutique beauty. Now, don’t expect everything to blow you away from the moment you sit down for your first jam session. The Fractal Audio, in its truest form, is the least polished sounding of the trio until you start working with it. Now, this is not a ding, really. If you plug in an actual amp, throw a mic in front of a cab and monitor that sound, the result can sound raw and rather uninspiring. The polish comes later, by both us guitarists in the form of effects and also further down the signal chain by the mix engineer or FOH engineer. So, use any of the numerous amps, a cabinet, and nothing more, and that’s exactly what you’ll hear: a raw, unpolished sound. After peppering with effects and options, though, we then achieved fantastic, studio-ready tones that were inspiring. The fact the Fractal Audio lets us fail and make it sound bad is actually a realistic and great feature. Dial in most amps bass knobs all the way up, for example, and it’ll sound horrible. It’s no different with the AX8. It is happy to let you live with your own decisions, good or bad! But to get the most out of the AX8, you’ll have to put in some effort to craft your tones, just like you would with a real rig. We grabbed our Knaggs Doug Rappoport Kenai for sound testing with the Helix. Scrolling through a few presets, we found a wide range of sounds arranged across two preset folders. Most presets seemed to be structured after songs, and we must say the sounds were pretty much right on the money! Dire Straits, Metallica, and The Police guitar sounds were authentic and fun to play. Many of the classic effects were accurate, however in the digital realm the vibe is somewhat different and lacks the three-dimensional quality at times. As with the AX8, it’s like playing guitar in the studio. We found the Fender, Mesa and Marshall type tones to be authentic, yet when dialed in for high-gain settings, somewhat tamer and a little more predictable than their physical counterparts. This may be a good thing for us if we were recording and wanting consistent results, but if we wanted an amp with a little bit of fight to it, these models weren’t quite as loose as the real thing. The sound was right, but the feel was a little too perfect and consistent. Writing our own presets gave us the best results. Selecting the Cali IV Lead, obviously based on the Mesa/Boogie Mark IV (we own more Mesa amps than we can count), we were able to dial in some blistering lead tones, and adding the Vintage Digital Delay and a Deluxe Comp really polished the tone nicely, and made lead lines a pleasure to play. Line 6 includes dozens of original effects, and they are all very good. Every reverb effect (there are a total of 17) in the Helix is a Line 6 effect, not a model of other products, which is perfectly fine given that type of effect. There are, however, many models of other classic effects that are generally true to the originals. In particular, the BOSS CE-1 definitely has the vibe of the original pedal and sounds fantastic. We played the HeadRush pedalboard with both a 1990 GMC Ibanez Universe as well as a Knaggs SSC for sound testing. Scrolling through the presets was fun, and we particularly liked the lead tones in the HeadRush. Lead tones and crystal clean sounds seemed to stand out the best. The effects had a nice wide spread to them, and clearly a lot of time was spent in writing presets for the HeadRush. The sounds were polished and fun to play. However, many tones struck us as being a bit too polished. Out of our three review units, the HeadRush felt most like a software plug-in. This makes some sense to us, considering it was based on Avid’s Eleven software in the first place. For a decade or better, guitar amp sims have existed as computer plug-ins, and they’ve served guitarists in both live and studio settings. A common complaint is they don’t feel or faithfully sound like the actual amps they’re replicating. The HeadRush was somewhat hit and miss in this department. Yes, the Mesa Recto model was somewhat in the ballpark, but owning several examples of Rectifiers, it was pretty clear there was no miked up Rectifier in another room and that we were playing a model. It did not behave like the physical amp, nor did it have the three dimensional, harmonically rich content of the amp, either. The same held true for Fender and Marshall sims as well. They were more one-dimensional sounding and not quite as versatile as the real amps. Good sounding, yes, but not quite as inspiring as the other products under review. Despite not being as sonically accurate as the other products, the HeadRush scores high on the fun factor. The sounds are perfectly giggable, and we could definitely record convincing guitar tracks with it. But if you want ease of use, and the shortest path to solidly good results, you’ll want the HeadRush under your feet. Considering many guitarists have been living with plug-ins for years, the HeadRush is a modern, next generation solution that builds on that approach and puts the flexibility and convenience of a software product in the palm of your hands. No… make that the ball of your foot. Tracii Guns of L.A. Guns demonstrates his use of the HeadRush. All three pedalboards have an online and printed manual that covers all aspects of functionality. We found the manuals to be thorough, well written and perfectly adequate. All three products have tons of support available online within forums as well as Facebook groups. Moderators in the forums are quite active in resolving issues and answering questions. Both HeadRush and Line 6 offer direct phone support if email and online are insufficient to you, while Fractal offers email with telephone follow-up as needed. Each of the products offers a one-year warranty. The Fractal Audio AX8 sells for $1,099. Given its superior sound, extensive number of available models, and strategically small footprint, this unit provides a fantastic value for anyone looking to get into the Axe-FX family, assuming you can live without a headphone output. The Line 6 Helix Floor sells for $1,499. With its superior routing, usefulness as an audio interface, and sleek design, it still provides a good value, despite being the costliest of our test units. 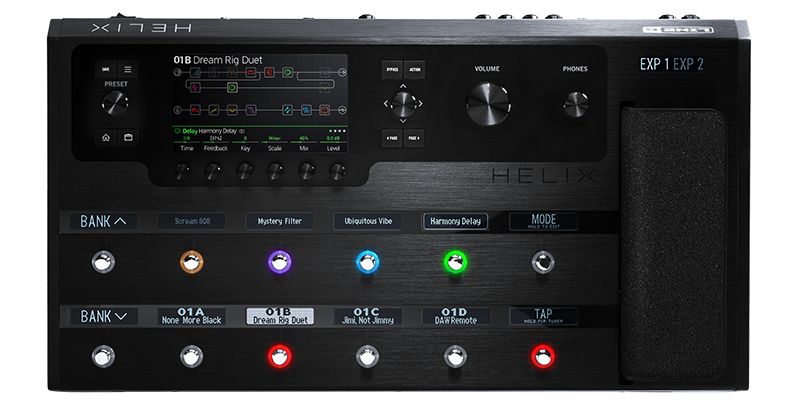 If you don't require all of its capabilities, the new Helix LT provides most of the same capabilities for just $999. And if you're glued to the computer in the studio, Helix Native delivers the same functionality minus the hardware for much less. The HeadRush Pedalboard (MSRP $1,999.00) sells for approximately $1,000. The advanced touchscreen and super easy-to-use interface coupled with solid sounds makes this unit a solid value, while always being a lot of fun to use.